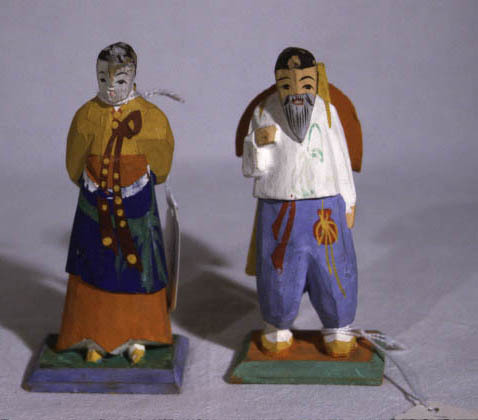 KOREAN WOODEN FIGURES A:simply carved wooden man on wooden base. top of head painted black for hair; black painted eyes, brows. red mouth, grey beard with black marks detailed into it. background of face painted flesh color as are hands. black jacket with green sash which is now faded. yellow painted wooden frame for the orange painted cardboard holder. pants(cham pengi) are painted pale purple. red sash painted on pants as is a small red tie-string bag with yellow tie- strings. shoes(komushin)are white on top and yellow around the base. stand orange on top and green around edges. B:simply carved painted wooden woman with babe on back and wooden base. Painted black hair, eyes and red mouth. face white as are hands. yellow jacket (chokori) with red 'V' neck collar with yello dots. dark red/brown bow/sash with yellow dots. orange skirt cut at bottom to show shoes(komushin) which are white and yellow. she carries baby on back with blue apron(chuh nay poh tay ki). tied in green with white border along top. baby's head has painted black hair and eyes and flesh colored face. below baby's head is a painted red patch with green to either side. woman stands on wooden base painted green on top and pale purple around the edges.